This year's one and only silent movie, the French production The Artist, received 10 Academy Award nominations, including best picture, best director, and best actor. But the dog star, the Jack Russell Terrier named Uggie, who really did steal the movie, got not even a nod from the venerable Academy. That's why the doggie underground started the Facebook campaign, Consider Uggie. It's clear from the comments on Facebook that Uggie just may have more fans than some of the human stars who got the nod from old Oscar. 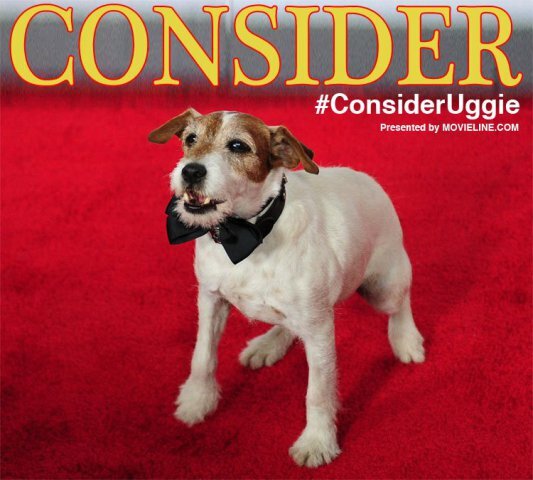 One Uggie fan proposed that the terrier had at least a million times more talent than the "acting black hole Brad Pitt," who was nominated for Best Actor in Moneyball. Apparently the Oscar snub was too much for Uggie's trainer, Omar Von Muller, because a day after the Academy Award nominations were announced, came the announcement that Uggie was being retired. The fact that the Academy did not set up a separate category for Best Dog Actor must have come as a blow, especially after the elaborate media tour just completed by Uggie and his master. But the award season is not over yet. The Golden Globes nominated Uggie for TWO Golden Collar Awards for Best Dog in a theatrical film: one for The Artist and the second for Uggie's role in Water for Elephants. Honor Your Battle Buddy! The BONUS Veteran's Day Animal Video Of The Day!! !